Construction of the Gulf Intracoastal Waterway, Boston Canal, and oilfield canals has greatly increased tidal exchange between Vermilion Bay and the adjacent marshlands to the north, particularly near their confluence with Vermilion Bay. This tidal exchange, combined with the effects of wave action from the bay and boat wake from traffic on the canal, has contributed to significant shoreline erosion along the Vermilion Bay shoreline. This same set of problems has also caused shoreline erosion along Boston Canal, particularly near its confluence with Vermilion Bay. Rock dikes configured as sediment traps were constructed along the shoreline at the mouth of Boston Canal to promote sediment deposition and protect the shoreline and adjacent wetlands from continued wave-induced erosion. Vegetation was planted along 14 miles of the Vermilion Bay shoreline to act as a wave buffer and decrease shoreline erosion rates. The project encompasses 466 acres of brackish marsh along approximately 16 miles of Vermilion Bay’s northern shoreline adjacent to Boston Canal. Running from the Oaks Canal to Mud Point, the project is located roughly 6 miles southeast of Intracoastal City, Louisiana, in Vermilion Parish. The survivorship and vegetation cover percentage along the shoreline were more pronounced in areas where native vegetation did not exist. Survivorship and percent cover were least pronounced when marshhay cordgrass (Spartina patens) was planted in established stands of roseau cane (Phragmites australis). Overall survivorship of planted smooth cordgrass (Spartina alterniflora) was over 90% after 12 months. Current coverage is nearing 100%. The 2005 OM&M Report concluded the sediment build-up behind the dike on the east and west sides is continuing and vegetation has taken over the exposed mud flats. Elevation data show an increase in sedimentation behind the rock breakwater. This project is on Priority Project List 2. With coastal needs continuing to grow, we can learn from nature’s history for ways to strengthen our coastlines. While we often think about how barrier islands protect the coast from storms, coastal cheniers and forests across Louisiana are also essential in providing that protection. These coastal forests are often found on shell ridges known as cheniers. French for “place of oaks”, cheniers act as storm barriers, prevent saltwater intrusion, and provide wildlife habitat for migratory birds and butterflies [1,3]. Cheniers along Louisiana’s coast extend from Cameron Parish in the west to Iberia Parish” . Due to their higher relief, or height above sea level, a large majority of these areas were cleared for human development uses such as highways, agriculture, and oil and gas . Louisiana originally hosted 100,000 to 500,000 acres of chenier, but today only 2,000 to 10,000 acres remain . While these numbers can be discouraging, local and state efforts are in place to conserve live-oak (Quercus virginiana) cheniers and coastal forests. Louisiana is fortunate to have programs and organizations like this to conserve the coast and its natural abundance. These practices along with landowner, volunteer and citizen engagement are essential to coastal restoration. 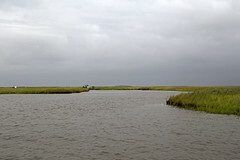 You may visit CWPPRA’s website lacoast.gov to learn how you can help Louisiana’s coastal wetlands! Do your part to conserve our environment and help Louisiana’s coast!